If your garden borders are a bit lacklustre by late summer, this post is for you. We take you on a tour through a garden where the owners have taught themselves a thing or two about keeping colour going when most of the roses and early summer favourites have faded. For colourful planting inspiration, Wollerton Old Hall in Shropshire (UK) is one of our absolute favourites. Prepare to be wowed and for our tips on how to get the look at home. Lemon and Lime at Wollerton Old Hall. Image: Chris Denning/Verve Garden Design. Lemon and Lime Plants at Wollerton Old Hall. Image: Chris Denning/Verve Garden Design. Spikes echoed at the rear with the leaves of grasses Miscanthus sinensis 'Gracillimus' and in front with the finer-leaved Molinia caerulea 'Heidebraut'. A dollop of unwaxed lemons brightening up the front in the form of Achillea 'Terracotta'. Although the flowers start the colour their name suggests, they eventually fade to this lovely pale yellow. Their flat tops contrast beautifully with the upright flowers and grasses. Purple stems and bright yellow flowers of the False Sunflower, Heliopsis helianthoides 'Prairie Sunset'- here seen flopping gently over the bench. More bright yellow from the Leopard Plant Ligularia dentata 'Desdemona' and lime green from Physocarpus opulifolius foliage in the background. For a bright, but restful effect, use a lemon and lime colour palette with some blue as a contrast. Contrast upright flower spikes and ornamental grass leaves with mounding plant forms throughout the border for a pleasing effect. 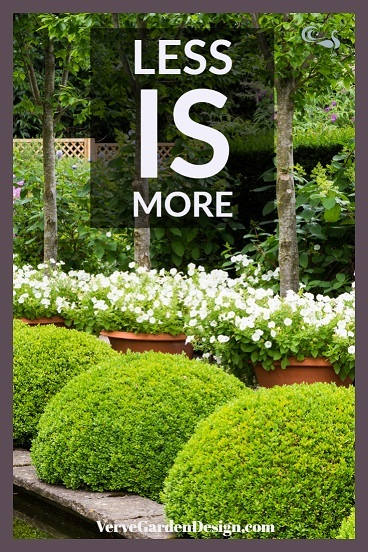 See our article "Design Better Garden Borders Using Repetition" for more on this. Add further contrast with flat-headed umbellifer flowers such as the Achillea. Their lacy quality keeps the effect light and airy. Make sure you incorporate plenty of foliage as well as flowers to make the space feel relaxing. Plants that flower in other seasons but have attractive foliage could work well for this. Larger clumps of the same plant (achieved by planting three or more initially) work much better that small dots of many plants. The Hot Borders of Wollerton Old Hall's Lanhydrock Garden. Image: Chris Denning/Verve Garden Design. Hot Colours are Perfect For Late Summer Gardens. Designed by Lesley Jenkins. Image Wollerton Old Hall: Chris Denning/Verve Garden Design. Arguably, the most spectacular garden borders in late summer and early autumn are those ablaze with fiery reds, oranges and yellows. In high summer, when the sun is nearest to the earth, these colours can appear too harsh and dazzling. By late summer though, the lower angle of the sun makes the light becomes softer and warmer. This makes flowers with hot colours glow. For me, they also distract from any notion that the summer holiday period is coming to an end. I love to use them to keep borders looking amazing at this time of year. For hot coloured-flowers to take centre stage plant them in front of a simple background, such as a hedge or painted fence. We explore this tip more in "12 Best Small Garden Design Ideas From Chelsea 2018". Repeat the dominant colours (red and yellow here) using similar flower shapes and types for a formal feel. Here, the border is more informal, with the red flowers of Dahlia 'Grenadier', Crocosmia 'Lucifer' and Helenium 'Sahin's 'Early Flowerer' bringing different round, linear and cone shapes, respectively. A sprinkling of dark foliage adds to the drama of the hot colour scheme from the Canna 'Wyoming' and Copper Beech. In smaller gardens try the shrubs Physocarpus opulifolius 'Tiny Wine' or Sambucus nigra 'Black Lace', or a fastigiate (pencil-shaped) beech tree. Keep them trimmed to the size you want. I was lucky to tour Wollerton Old Hall gardens with John Jenkins a few years ago and learned the genius tip of using repeated blue in hot borders to make them pop even more. I have incorporated blue ever since! You can find more on this and other planting design tips in "12 Garden Border Planting Design Trends From Chelsea 2018". Phlox paniculata and Thalictrum delavyi in the Summerhouse Garden at Wollerton Old Hall. Image: Chris Denning/Verve Garden Design. Pink Phlox Gives a Cottage Feel to Wollerton Old Hall in Late Summer. Image: Chris Denning/Verve Garden Design. A small, linear path leads up to the beautifully-crafted wooden summerhouse. In late summer you are guided to the door by unashamedly-blousy, pinky-purple Phlox paniculata. This is complemented in front of the summerhouse by the delicate purple Thalictrum delavayi 'Hewitt's Double'. Less is More. Sometimes restricting your borders to larger numbers of fewer plant varieties can have a tremendous impact. This approach also simplifies maintenance- always a good thing in my book! In large gardens, whole beds are often devoted to just one plant. Here you are able to use another part of the garden when this plant is not in flower. In smaller gardens where most of us don't have this luxury, try combining 2-3 different plant types to give several seasons of interest. At Wollerton, you can see the lovely lime green foliage of their Michaelmas daisy (Aster) collection framing the Phlox. These will provide a follow-on display from Late Summer well into the Autumn. Warm Colours in Deep Tones Add Drama To the Pergola at Wollerton Old Hall. Image: Chris Denning/Verve Garden Design. Purple Clematis and Burnt Orange Hemerocalis at Wollerton Old Hall. Image: Chris Denning/Verve Garden Design. While this section of the garden uses hot colours, they have been selected in more muted tones. The burnt orange daylilies (Hemerocalis 'Anzac') by the path have been complimented at the back of the border by pale orange Tiger lilies, Lilium lancifolium. The garden is kept light and bright with plenty of light green foliage. However, the real tone of the garden is set by the dramatic backdrop of dark Ligularia 'Desdemona' foliage and deep violet Clematis viticella 'Etoile Violette'. For classical perennial border style place taller plants at the back of the border and graduate the size down to lower growing plants at the front. Repeating a series of mound-shaped plants along a pathway creates a lovely, gentle rhythm that entices you to walk along it. Plants with an arching habit produce an appealing informal style when allowed to spill over the garden path. When several strong or dark colours are used, balance them with more calming greens. Grasses and foliage of other plants are ideal. Pergolas are wonderful for adding height and extra planting space to gardens. See more in "How To Make Your Garden Feel More Intimate With a Pergola". Phloc, Buxus and Petunias by the Reflecting Pool at Wollerton Old Hall. Image: Chris Denning/Verve Garden Design. Repeated Planting Used Effectively at Wollerton Old Hall. Image: Chris Denning/Verve Garden Design. Not all of Wollerton's garden rooms are dominated by bright colours in late summer. If the York stone-paved garden feels familiar to you but you have never visited, don't worry! There are countless amateur and professional pictures of it in magazines across the globe. Not to mention on Instagram and Pinterest. Here is our take on why it looks fabulous in late summer (and for the rest of the year). 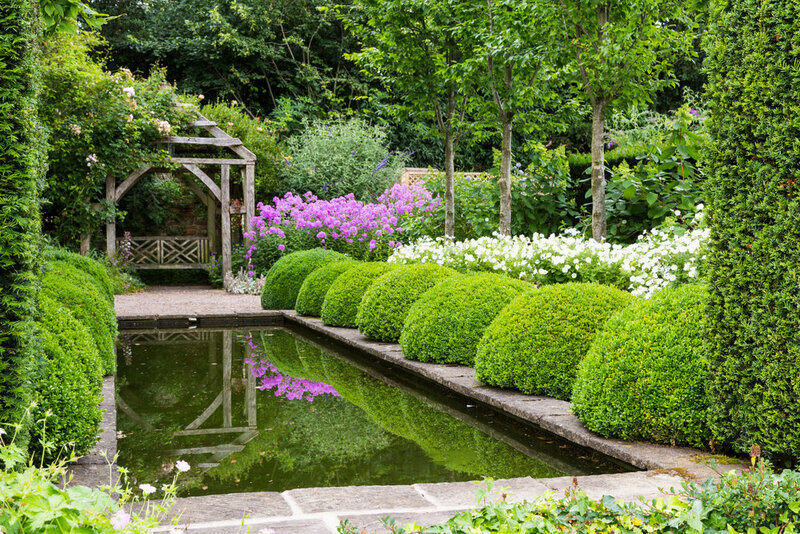 For a formal-style garden, start with a strong geometric shape. Here the key feature is the rectangular reflecting pool. (find more on formal and informal water features in "Which Garden Water Feature Should You Choose?". You could also use a lawn or a raised bed. A more modern styled formal garden would have fewer elements around the pond. At Wollerton Old Hall, however, the pool garden is enhanced with a classical style using several layers of repeated plants. Year-round, evergreen structure comes from symmetrical rectangular yew hedges and Buxus domes. Height is added with columnar hornbeam trees (Carpinus betulus 'Frans Fontaine')- an excellent variety for smaller gardens. Small evergreens, trees and shrubs are things you could repeat in your own garden. Although designed with a very strong permanent structure, this garden is also softened with flowers to give a seasonal twist. In the perennial border at the back a single colour of Phlox is used, as in Section 3 above. A row of pots with white Petunia Shock Wave™ 'Coconut' keep the colour palette restrained but allow a bit of flounce. This pot display of long-flowering annuals changes each year, with the garden team always on the look out for the best-performing white varieties. In Spring, the pots are filled with white tulips. Behind the pots are a row of taller white Hydrangea paniculata ‘Unique’ whose large cone-shaped flowers are not yet out in the image shown here. It takes a little confidence to limit your garden to only 5 or 6 plants, but if you spend enough time researching and choosing them wisely you can create a really stunning space. Buddleja, Thalictrum, Phlox, Achillea, Dahlia, Lychnis coronaria, Veronicastrum, Liatris, V. bonariensis and Salvia involucrata at Wollerton Old Hall. Image: Chris Denning/Verve Garden Design. Painterly Purple Borders at Wollerton Old Hall. Image: Chris Denning/Verve Garden Design. In yet another feat of planting design par excellence, the rather unassumingly-named Main Perennial Border at Wollerton Old Hall takes on a very modern palette of purples, violets, pinks, blues and whites in late summer. Designing any herbaceous border on this scale (23m long by 3.5m wide) takes a huge amount of gardening skill. However, ensuring that it remains expertly colour-themed and looking fabulous throughout a long flowering season requires knowledge at the top of the horticultural game. 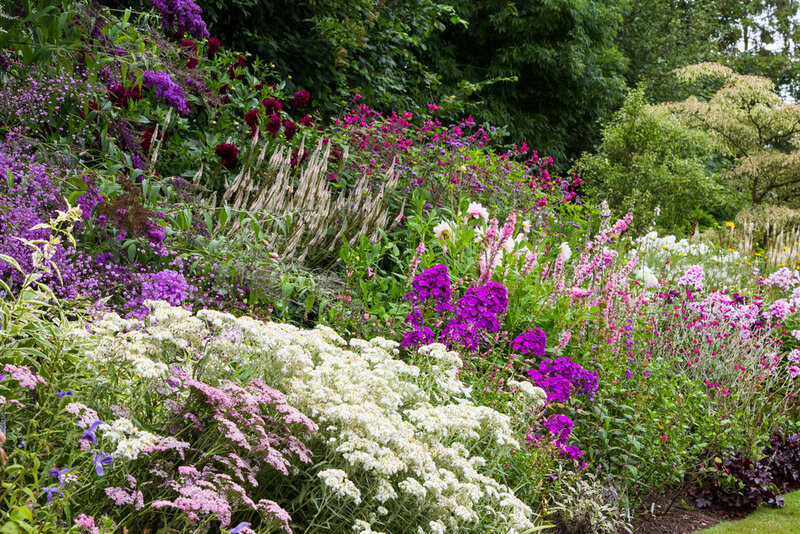 Unlike in some of the borders we have featured earlier, where there are more limited numbers of plant varieties, this border contains more than 70. The secret to success here is selecting plants that not only fit with the colour theme, height and pleasing flower shape criteria but also have non-spreading root systems that do not compete with closely-planted neighbours. You might think that we have no take-home ideas for this one, but not so! 1. If you love the look of a perennial border but don't have lots of experience- start small. Create a border of at least three metres long and start experimenting with a small number of plants. Pick a colour theme you like to make your choices easier and choose three heights appropriate to your garden to graduate from "tall at the back to lower at the front". Research plants on the internet in your chosen palette that are of the heights you would like- just search, for example, "purple flower late summer 1.2m high". Or use books if you have access to them (I do both!). Then narrow down your choices to ones that are hardy in your region and suitable for your soil type. Our blog subscribers have exclusive access to posts on topics such as how to test your soil. so subscribe to our weekly newsletter to make sure you don't miss out. 2. Don't make the cardinal mistake of making your border too narrow, or you will never have enough space for plants of different heights to thrive. Regardless of the length you have space for, never make them less than 1 metre deep. At this depth, you will only be able to fit in plants of three heights maximum. 3. Don't ever be afraid to experiment- gardens should bring pleasure, not anguish! Successful gardens like Wollerton Old Hall will have been developed with continuous trial, error and editing, so embrace the same ethos. I completely understand that plants can be expensive but there are many inventive ways to keep costs down. Local church, WI and garden group sales are great sources of cheap plants and free friendly advice. Friends and family will be more than happy to divide their own plants to give you a starter piece. You can also grow from seed, although many perennials will take 2-3 years to flower. What's the rush?- Gardens are slow pleasures. Wollerton Old Hall is a 16th Century house in the Southern English Midlands. Lesley Jenkins lived here as a child and then, serendipitously, saw it for sale and bought it with her husband in 1984. Lesley laid out and designed her private garden causing John to be increasingly interested and knowledgable over the years. Together with highly skilled Head Gardener Phillip Smith and Assistant Head Gardener Belinda Haworth they lovingly tend one of England's best loved garden treasures. The 4 acres make a lovely day out and we love that their are many seats and places to relax, not to mention a lovely tearoom and small plant sales area full of treasures. The gardens are not open every day, so check the Wollerton Old Hall website for details before you travel. Don't just go once, but at different times of the year. This special place is many gardens in one. What is your favourite colour scheme for late summer? Comment to let us know!